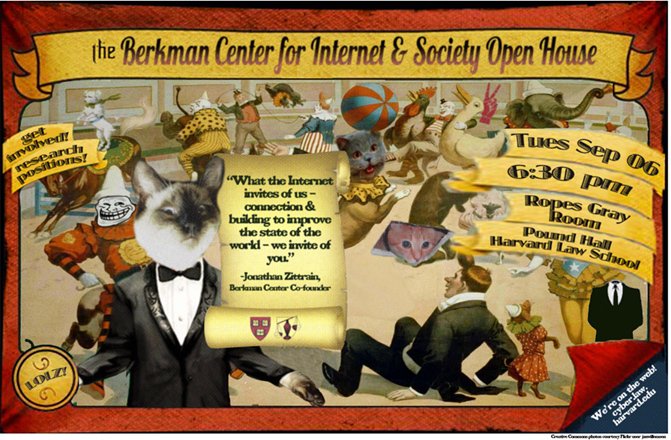 Come to the Berkman Center for Internet & Society’s Open House to meet our faculty, fellows, and staff, and to learn about the many ways you can get involved in our dynamic, exciting environment. As a University-wide research center at Harvard University, our interdisciplinary efforts in the exploration of cyberspace address a diverse range of backgrounds and experiences. If you're interested in the Internet’s impact on society and are looking to engage a community of world-class fellows and faculty through events, conversations, research, and more please join us to hear more about our upcoming academic year! Paid part-time research positions will be available in the fall, and you can visit http://cyber.harvard.edu/getinvolved/internships to see the current available openings. People from all disciplines, universities, and backgrounds are encouraged to attend the Open House to familiarize yourself with the Berkman Center and explore opportunities to join us in our research. We look forward to seeing you there!